Indiana Raptor Center presents a lighthearted program that utilizes storytelling and natural history to convey important facts about birds of prey, nature, and the environment. Sometimes we even throw in a song or two to sweeten the pot! We seldom have more than a sliver of time to effectively teach kids or adults about nature, the environment, and the inherent value of wildlife. The Internet, TV, movies, and video games vie for the top priority with children who live in a fast paced world. But direct contact with nature is a terrific way to connect people with their environment. 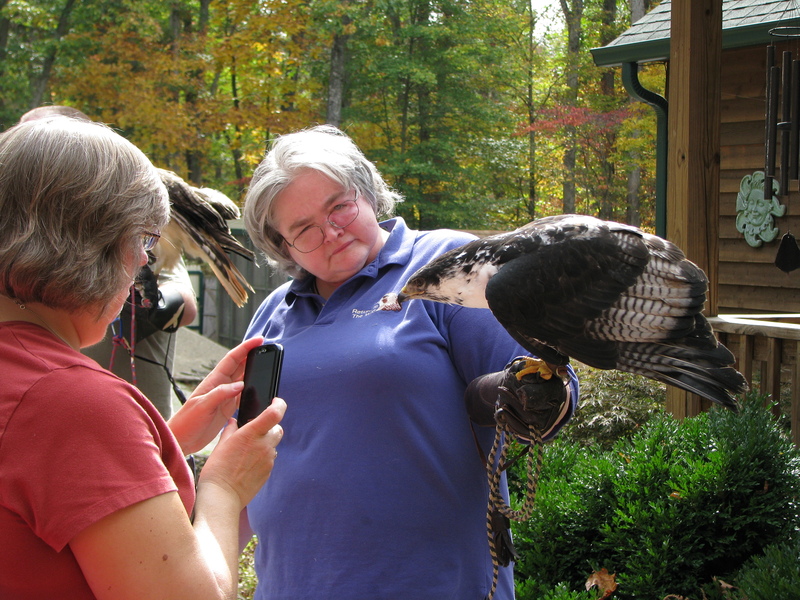 Imagine the thrill of live birds of prey at your school, museum, festival, civic organization meeting, nature center, or scout troop. We have even educated at wedding receptions! How flight works; wing structure and function; feather structure, function and specificity; audience participation; includes Powerpoint, biofacts (bird wings and parts), and live birds of prey. Photography is permitted. 45 min-1 hr. Wildlife rehabilitators are licensed professionals who aid injured and orphaned animals – however, the public can lend a valuable hand to this process. Powerpoint and live birds of prey are used to illustrate the need and the actions that you can take to preserve wildlife wherever you live or go. The importance of habitat and respect and care for our environment is discussed. Photography is permitted. Handouts. 1 hr. We bring five live Indiana birds of prey – falcons, hawks, owls. Also includes taxidermy specimens and biofacts (bird wings and parts). Subject matter includes natural history of common Indiana species, a comparison of diurnal and nocturnal traits and behaviors, and how our actions affect these birds both collectively and as particular species. The importance of habitat and respect and care for our environment is discussed. Photography is permitted. 1 hr. Raptors have a great influence on our economy through their consumption of mass quantities of rodents. This presentation tells you who lives where and how to preserve and enhance habitat to maintain raptor populations on your property – for fun, environmental restoration and preservation, and profit for those who farm. The importance of habitat and respect and care for our environment is discussed. Presentation includes a Powerpoint and live birds of prey. Domonic Potorti with Oberon the Barn Owl, displaying his wings. We bring four live Indiana owls and a live hawk or falcon for species/anatomical contrast. Also includes taxidermy specimens and biofacts (bird wings and parts). Subject matter includes how owls are different from diurnal birds of prey, and the special tools that allow them to hunt, raise young and survive in a nighttime world. The importance of habitat and respect and care for our environment is discussed. Native Americans hold the environment around them in high regard. One of their most respected creatures is the bird of prey. We discuss various species and their spiritual significance. The importance of habitat and respect and care for our environment is discussed. This is a high level overview Powerpoint presentation, and will include the use of live birds and Native American music. What are crops? What foods and food processing do they support? What threatens crops? What protects crops? The answers to some of these questions may surprise you. There are more than food chains – there are food webs, and they affect you every day! Raptors are our natural food heroes. How do we help them succeed? We use live birds of prey and visual aids to build a food web during the presentation. The importance of habitat and respect and care for our environment is discussed. Photography is permitted. Poster distribution. 1 hr-90 min. Explore the history, art and sport of falconry, an ancient practice where a human and a bird hunt cooperatively. We bring a variety of birds and equipment used in falconry and discuss how the sport has influenced history, society and our language. We also discuss the process for becoming a falconer in Indiana. Photography is permitted. 1-2 hr. For your convenience, here you can find the handouts we share at our live programs. We love the nesting box diagrams shared by the Maryland DNR. Building a nesting box is a great activity for families – especially when you get to see birds of prey use them to raise their own young. Shannon K. Jacobs, author of Healers of the Wild: Rehabilitating Injured and Orphaned Wildlife, produced “What to Do” flow charts for finding injured animals. They are terrific resources and have become very popular among rescue organizations. Both of these downloads are provided by the National Wildlife Rehabilitators Association. Recent years have seen a troubling rise in the numbers of shootings of birds of prey. There are so many obstacles to a raptor simply making it to its second year, that it is especially heartbreaking to take in a bird who has been purposefully shot. In response, we have brought together a coalition of wildlife rehabilitators, conservation groups, and private companies under the banner of the Raptor Alliance Project. With the support of these groups, we’ve printed an educational poster entitled “A Valued Ally.” Designed by InRC volunteer David Orr and inspired by previous poster projects in other regions, it is our hope that it will help the public come to understand that in addition to raptors’ inherent value as part of our environment, they have a role to play in the economy, as well. The poster features a gorgeous illustration of a Red-tailed Hawk by famed wildlife artist William Zimmerman, illustrator of the essential 1984 tome The Birds of Indiana. We are grateful to the Zimmerman estate for allowing the use of this captivating piece, which so wonderfully captures this familiar raptor’s rightful place in a farmland setting. You may have seen the poster around the region where outdoorsfolks gather; if you would like to obtain one, please contact us to find out how.